Put on your poncho and sombrero and go to Mexico for a fantastic fiesta with neon lights, where you will find a lot of tequila. 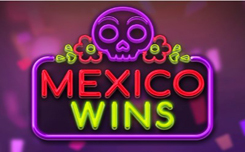 Mexico Wins is a new game from Booming Games, offering an amazing party with lots of liqueurs and even more profitable payouts. The game is an interesting combination of a classic fruit machine and a modern video slot. In the slot Mexico Wins five reels and 30 paylines. Visual images represent neon lights and traditional Mexican fiesta. The main symbol is Pinata, since it starts the Free Spins function. The ancient pyramid of the Aztecs is a wild that replaces all symbols, and also triples all victories when participating in a winning combination. Watch the 2-Way Pay system, which is always active and allows players to win combinations from left to right, and vice versa. To run the Free Spins function, players need to catch three or more Pinata Scatters any where on the reels. You will receive 10 free spins. If during these spins, you catch three more scatter symbols, you will get 10 additional free spins.